Mama monkey Abbey, who carries a baby on her back, isn’t so sure about changing habitats. Corralling spunky squirrel monkeys is no easy task. 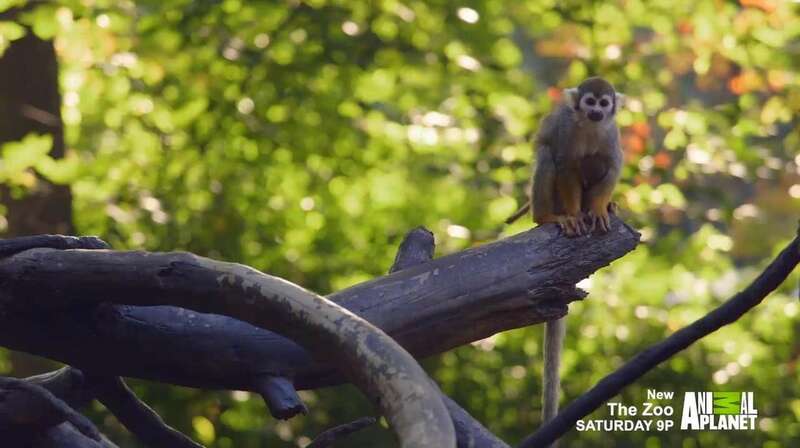 In this exclusive clip from Saturday’s upcoming episode of Animal Planet’s “The Zoo,” keepers at the Bronx Zoo try to move some of the monkeys from an outdoor enclosure to their toasty winter digs. “They are not meant for this cold weather, but it’s not like we can just explain to them, ‘We are going into winter holding. It’s a great place. There are toys! Your friends are there!’” Melanie Lumba, a keeper at the Children’s Zoo, says in the episode. The task proves especially challenging for one reluctant mama monkey named Abbey, who carries a little baby on her back. The popular reality show provides a behind-the-scenes look at how Wildlife Conservation Society staff at the Bronx Zoo care for the wide variety of animals that live on the sprawling 265-acre site. During it’s second season, which kicked off March 10, the show has featured heartwarming tales about a baby snow leopard that needed physical therapy, a kangaroo named Dave who received cryotherapy for his arthritis and efforts to mate a pair of Komodo dragons. But there’s heartbreak as well, as veterinarians and staff are forced to make tough decisions about critically ill animals. Lisa Lucas, executive producer of “The Zoo,” said the show has resonated with viewers — many of whom have traveled to the Bronx park in search of the animals and staff highlighted on various episodes. The Zoo airs at 9 p.m. Saturdays on Animal Planet. Bronx Zoo life returns for season 2 of ‘The Zoo’An adorable baby snow leopard who struggled to crawl will receive physical therapy treatments.